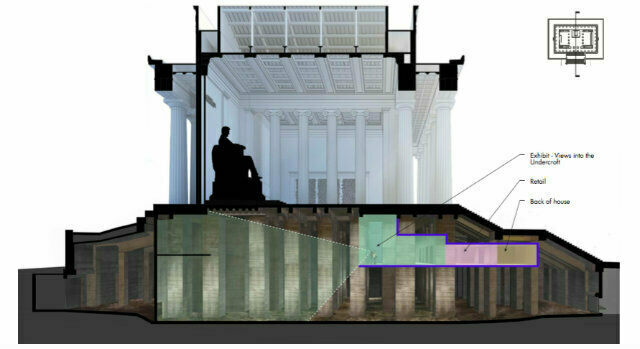 Ascend the 145 white marble steps at the Lincoln memorial, step forward into the shrine room with the seated Great Emancipator, and then direct your gaze down at the floor. Unseen beneath the Tennessee pink marble floor lies a cavernous three-story, 43,800-square-foot basement with architecture that wouldn’t look out of place in a World War II bunker. 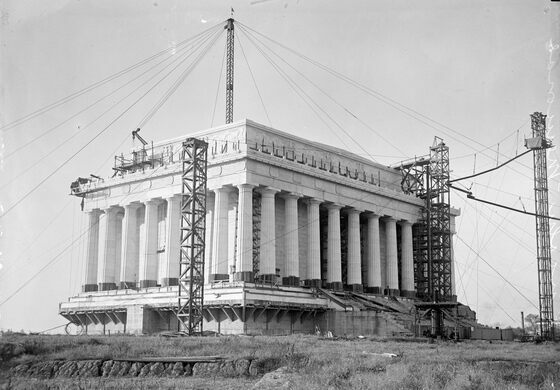 Construction began on the Lincoln Memorial in 1914 on the muddy stretch of land known as the Potomac flats. The Army Corps of Engineers had just finished its 40-year-long dredging and landfill project that produced the shoreline we know today. Workers had to dig down 40 feet before work could begin on the marble monument. Here they poured dozens of concrete columns to support the surface structure. The underground cathedral of concrete pillars was then simply forgotten about until renovations in 1975. According to the Washington Post, in preparation for the Bicentennial, the memorial’s bathrooms were renovated, and the construction crews started peering into the building’s foundation. They brought along their friends, some of whom belonged to the National Speleological Society. The cellar was deemed a cave, complete with stalactites and its own ecosystem (insects, rodents, etc). For a time, the National Park Service offered flashlight tours of the Undercroft, but they were abruptly halted in 1989 when a tourist noticed asbestos and flagged it for authorities. Over the years there have been several proposals to put the space to some productive reuse. For example, in 1992 head of the Capitol Historical Society Fred Schwengel tried to get the Department of the Interior to open a museum in the Undercroft where they could display Lincoln’s papers and memorabilia. Schwengels proposal died on the vine like all the others in the face of strong opposition from the National Park Service. That would be the end of the story, except for an announcement in June, 2017 that the NPS now wants to rehab and open up the Undercroft in time for the Lincoln Memorial’s centennial in 2022. Their proposal to the National Capital Planning Commission includes a rendering showing a platform floating out into the underground space that will allow visitors to get a look at the columns and graffiti. Coordinates marks the doorway to the Undercroft. It's not open to the public yet.